Brent and Jamie return to Triangle Park for a limited engagement. 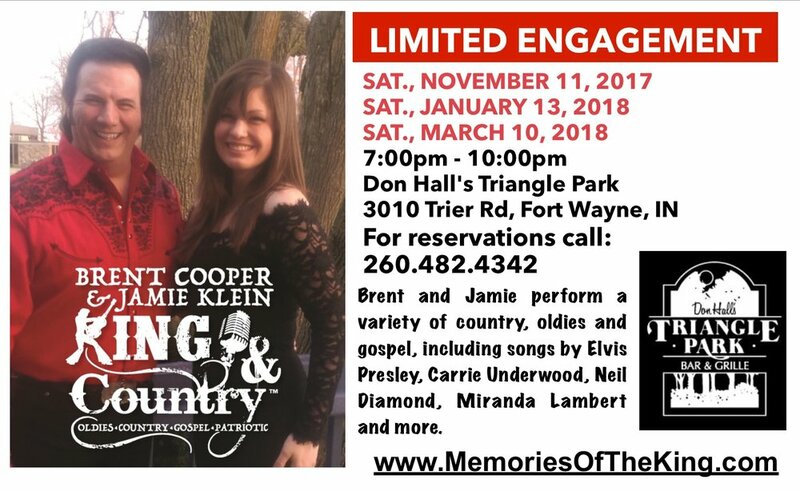 This is the second of three performances of "King & Country", variety of music including hits by: Elvis Presley, Carrie Underwood, Neil Diamond, Miranda Lambert, and other Oldies, Country, Gospel songs. It showcases both vocalists individually as well as together on beautiful duets. Brent will of course take requests for Elvis and Neil songs, so let him know if you have a favorite. We hope you come out to this great local restaurant and enjoy a wonderful meal and relax in the lounge and enjoy the music. Seating is limited. Reservations recommended.